In conjunction with the Swedish release of SPECTRE a few weeks back the the local Donald Duck magazine had a James Bond spoof special. I have seen this before and a quick Google search shows proofs that this has happened in other countries as well. I must confess that I was a bit taken buy surprise by this. I thought this to be illegal since the story and the names are so close to the original characters owned by Eon Productions. One would be surprised if the Walt Disney Company did not know what they were doing. I am therefore quite certain that this is OK. So, back to the comic released in Sweden a few weeks back then. 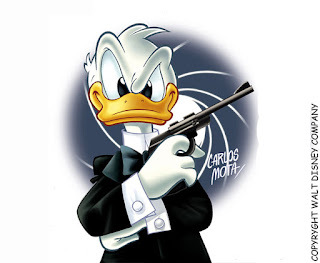 The story was called "Donald as Agent 007" and is about Donald looking just like Jens Bomb and being called to M's office to meet with Bomb who have been in a accident and needs to be replaced. 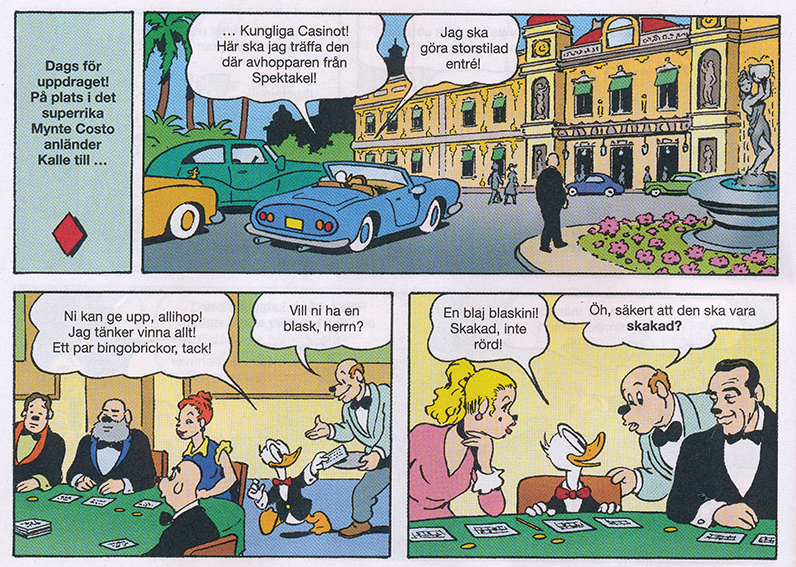 He drives the car to the casino where he drinks a soda, Shaken not stirred. And since it is a soda you can understand what happens when he gets it shaken. 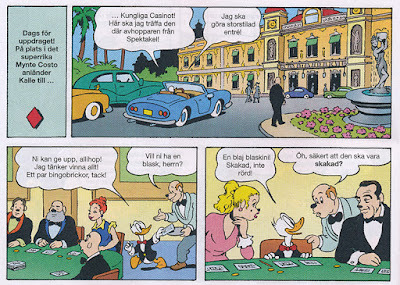 At the casino he also meets the henchmen Odd Crack who works for the organisation SPECTACLE. The car chase takes place and off course Donald's car has an ejector seat built in. The car can also turn itself into a submarie. 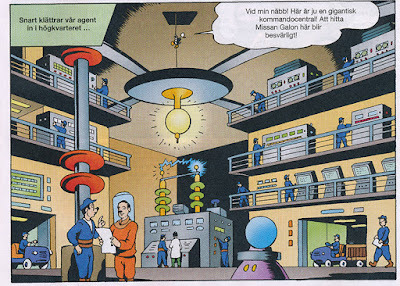 Donald drive's off to the lair of "Recorder" that in Swedish is "Blockflöjt" and that sounds just like Blofeld (note the Dr No character below). He get caught and strapped to a table with a laser beam. Will he be able to save the town of Duckburg from SPECTACLE? Well I guess you have to read the comic to find out. 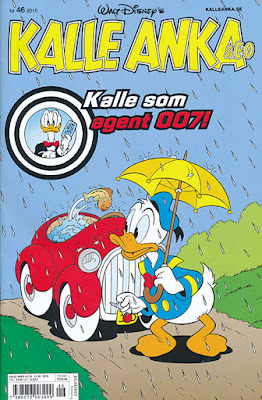 Below you can see the local Swedish cover for this story. Is this something you would collect to complete your collection of James Bond memorabilia even more? Would love to hear your thoughts on this.